Figure 2. 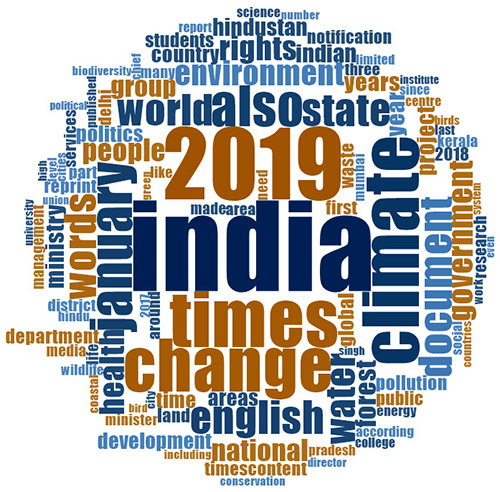 Media coverage of climate change or global warming across The Associated Press, Agence France Press (AFP), The Canadian Press, and United Press International(UPI) wire services. In Europe, some coverage focused on a continuing trend toward decarbonization and electric transportation. For example, media focused on Germany’s announced plans in January to phase out all of its coal-fired power plants over the next two decades. In addition to abundant media attention in the German press, journalist Erik Kirschbaum from the Los Angeles Times reported, “the announcement marked a significant shift for Europe’s largest country — a nation that had long been a leader on cutting CO2 emissions before turning into a laggard in recent years and badly missing its reduction targets. Coal plants account for 40% of Germany’s electricity, itself a reduction from recent years when coal dominated power production”. As another example, coverage noted record-setting electric vehicle sales in 2018. Journalists Camilla Knudson and Alister Doyle commented, “Almost a third of new cars sold in Norway last year were pure electric, a new world record as the country strives to end sales of fossil-fueled vehicles by 2025… The independent Norwegian Road Federation (NRF) said on Wednesday that electric cars rose to 31.2 percent of all sales last year, from 20.8 percent in 2017 and just 5.5 percent in 2013, while sales of petrol and diesel cars plunged”.